MILLAR, Ellen J. 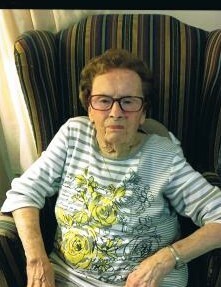 "Eleanor" (McEachern) Of East Boston and Revere, June 24, 2018 in her 99th year. Beloved wife of the late William J. Millar. Mother of Elaine LaMonica of Revere and her late husband Charles and Ann Hogan and her husband Thomas of Winthrop. Sister of Catherine Giadone of Tewksbury and the late Mary Cobb, Anna McGillvary, Duncan, Alan and Daniel McEachern. Also survived by five grandchildren, nine great-grandchildren, many nieces and nephews. Funeral from the Magrath Funeral Home, 325 Chelsea St [at Day Sq] EAST BOSTON Thursday morning, June 28, at 9. Funeral Mass in the Sacred Heart Church, 45 Brooks St., East Boston at 10 o'clock. Relatives and friends invited. Visiting hours Wednesday, June 27, 5 - 8 PM. Donations in Eleanor's memory to St. Jude Children's Hospital would be appreciated.